The City of Salida ( ; Spanish: , "exit") is a Statutory City that is the county seat and most populous city of Chaffee County, Colorado, United States. The population was 5,236 at the 2010 census. 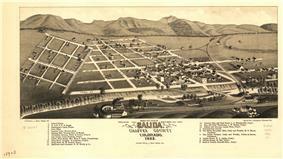 Founded in 1880, Salida was originally a railroad town and was a significant link in the Denver and Rio Grande Western Railroad. 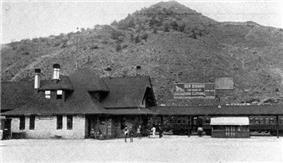 After World War II the railroad began pulling back its operations in Salida. Many residents in the 1950s, 1960s, and 1970s worked either in local ranching operations or commuted north to Leadville to work at the Climax Molybdenum Company. Today, the most prominent business in Salida is tourism, consisting of skiing at Monarch Ski Area, whitewater rafting, kayaking and outfitting, particularly on the Arkansas River. Salida is home to the annual FIBArk kayak race, one of the oldest whitewater races in North America. Salida is located in southeastern Chaffee County at (38.531442, -105.996090). According to the United States Census Bureau, the city has a total area of 2.2 square miles (5.7 km2) of it is land, and the Arkansas River, which runs through the town, is the major source of water for local agriculture. The Sawatch Range runs north and south and is located roughly 10 miles (16 km) west of Salida. Methodist Mountain, which is a major feature on Salida's southern horizon, is the northernmost mountain in the Sangre de Cristo Mountains. To the north of Salida is the Arkansas Valley and the town of Buena Vista. U.S. Route 50 runs along the southern edge of the city and leads east down the Arkansas River 58 miles (93 km) to Cañon City; to the west it leads 4 miles (6 km) to Poncha Springs and 63 miles (101 km) over the Continental Divide to Gunnison. As of the census of 2000, there were 5,504 people, 2,504 households, and 1,449 families residing in the city. The population density was 2,480.1 people per square mile (957.3/km²). There were 2,748 housing units at an average density of 1,238.3 per square mile (477.9/km²). The racial makeup of the city was 92.66% White, 0.05% African American, 1.44% Native American, 0.38% Asian, 0.02% Pacific Islander, 3.29% from other races, and 2.16% from two or more races. Hispanic or Latino of any race were 10.76% of the population. There were 2,504 households out of which 25.0% had children under the age of 18 living with them, 45.9% were married couples living together, 8.6% had a female householder with no husband present, and 42.1% were non-families. 35.9% of all households were made up of individuals and 15.4% had someone living alone who was 65 years of age or older. The average household size was 2.15 and the average family size was 2.80. In the city the population was spread out with 21.4% under the age of 18, 6.3% from 18 to 24, 27.5% from 25 to 44, 24.2% from 45 to 64, and 20.6% who were 65 years of age or older. The median age was 42 years. For every 100 females there were 94.6 males. For every 100 females age 18 and over, there were 92.7 males. The median income for a household in the city was $28,790, and the median income for a family was $38,240. Males had a median income of $30,447 versus $20,867 for females. The per capita income for the city was $17,252. About 9.2% of families and 14.8% of the population were below the poverty line, including 23.7% of those under age 18 and 13.7% of those age 65 or over. The city is served by Salida Public Schools. There is one public high school, Salida High School. ^ "Geographic Identifiers: 2010 Demographic Profile Data (G001): Salida city, Colorado". U.S. Census Bureau, American Factfinder. Retrieved June 20, 2014. Salida, Colorado – Lodging, Real Estate, Recreation, Shopping, Dining and History.